If you’ve been a Martha Stewart Living magazine reader like I have for years or if you’re an active gardening blog reader, then chances are you’ll know the name Margaret Roach. She worked for MSL for 15 years, first as Gardening Editor and then as Editorial Director. 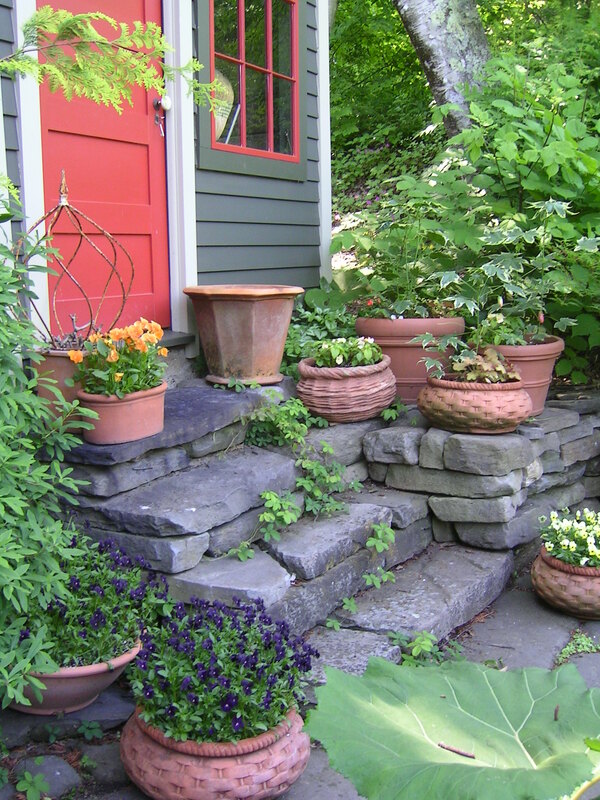 Today she oversees a very readable and comprehensive gardening blog called A Way to Garden. 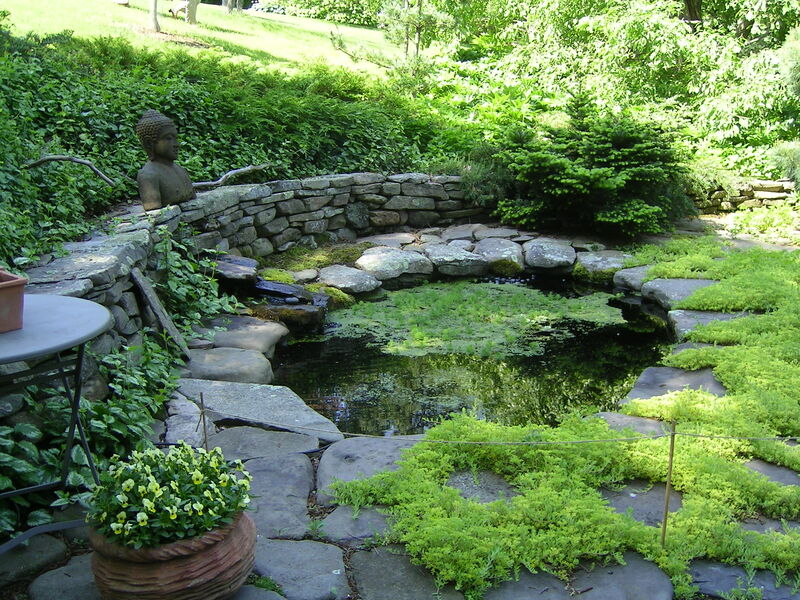 Her country garden in Copake Falls, New York, had been her retreat while she worked in Manhattan and it was often featured in the magazine. 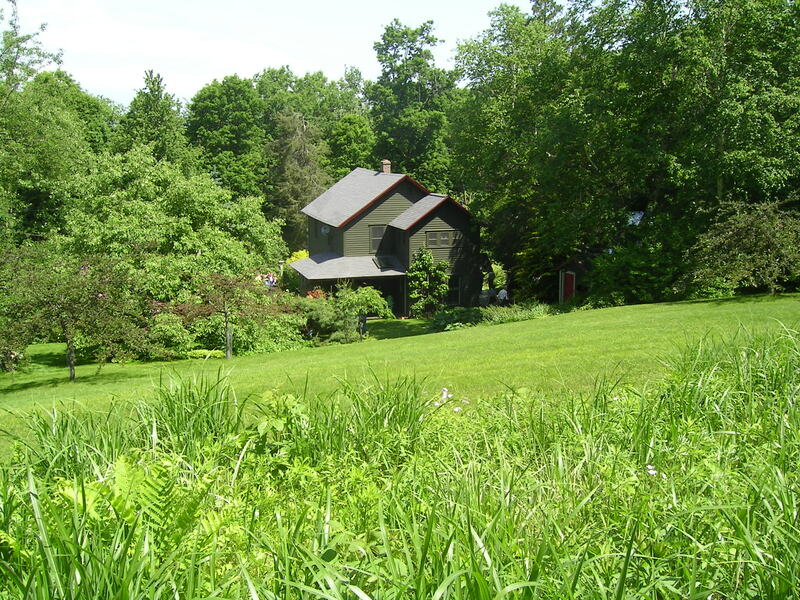 When she retired from the magazine in December of 2007, she embraced this home and surrounding land with both arms. My friend Patti and I visited her beautiful garden during the Garden Conservancy’s Open House Days two years ago and I thought you’d like to see what we saw during these snowy days. Walking up the driveway past the garage we’re first greeted by this exhuberant display of flowering violas, pansies and osteospermums, as well as a phormium (New Zealand flax) that would have been overwintered indoors (or in a frost-free spot). The table to the left is where Margaret’s local plant provider, Loomis Creek Nursery, is selling plants (I see from the website that it’s for sale — eek! Who wants to own a stunning nursery?). I’ll give details on our visit to this nursery in a later post. This cluster of pots and ‘stuff’ shows off Margaret’s collection of tender plants (Begonia rex and Clivia), a beautiful Chinese trough pot acting as a water feature and the so-called ‘Wavehill’ chair in chartreuse mimics the golden Hinoki falsecypress peaking in from the right. 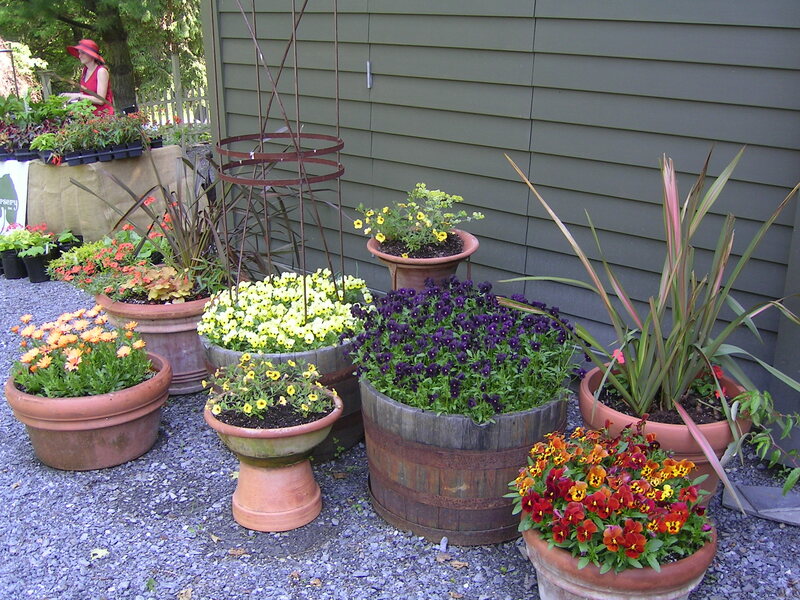 You can see from the potted displays that beautiful terracotta pots are common here. I remember reading that Margaret is a firm believer in continuity when it comes to pots — they must all relate to one another, that way they don’t end up looking like a hodge-podge. You can also see that she has excellent colour sense, as evident by the paint treatments on both the house and shed. 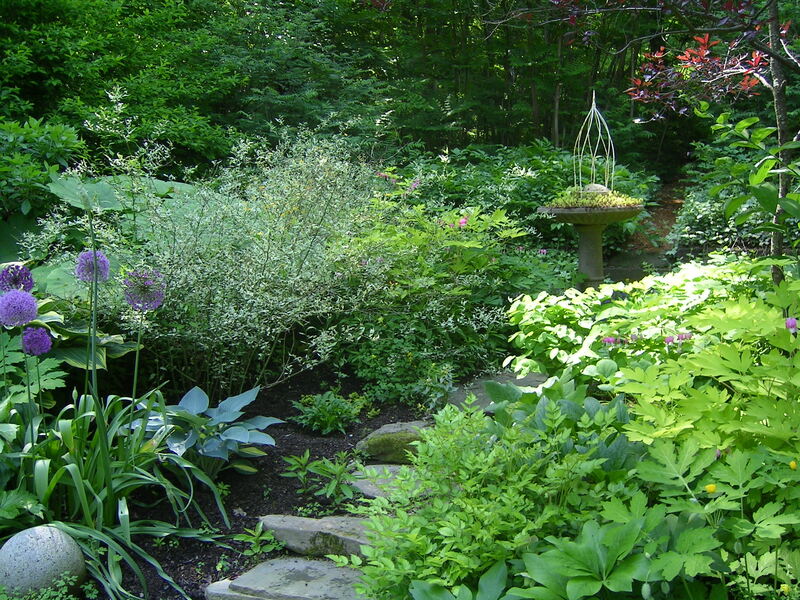 Her plantings and planting beds were impeccable; everything was so tidy and well designed. Margaret would be the first to say how, when she started her garden, she was a novice. Through her association with the magazine she was lucky to be able to meet and forge friendships with some of the most experienced and influential gardeners in the country, who helped develop her skills with plants and design. P.S. 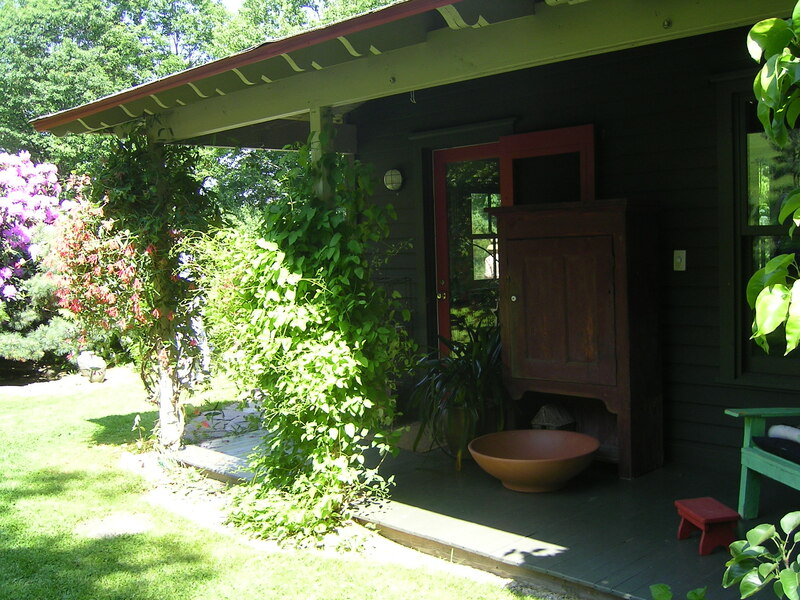 The big clay bowl on her porch is usually lined with a blanket making it one of the favourite resting places for her cat! Margaret once wrote that she considered removing this rhododendron! Can you imagine? We’d die in Ottawa for one that grew to be that size. The generous pile is in an area not very visible from the garden, but conveniently right behind the vegetable plot! 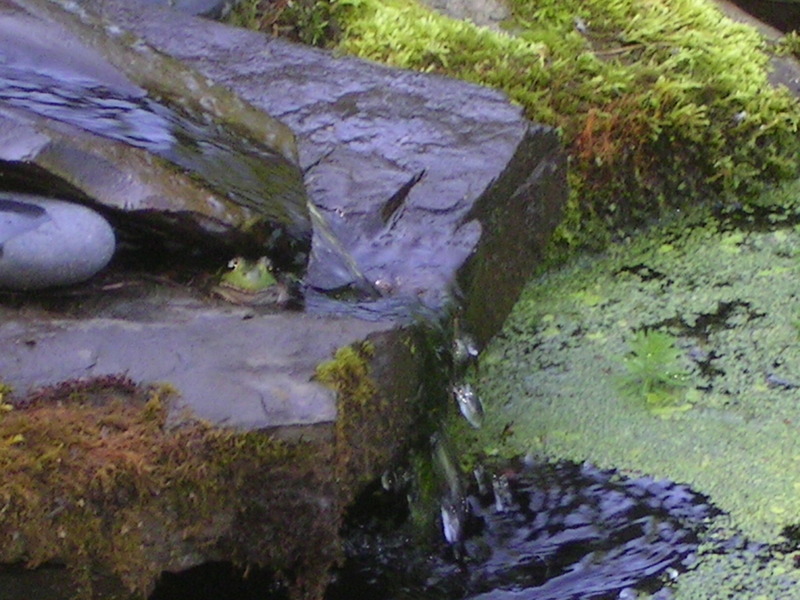 Sorry for the quality of the close-up — do you see him? 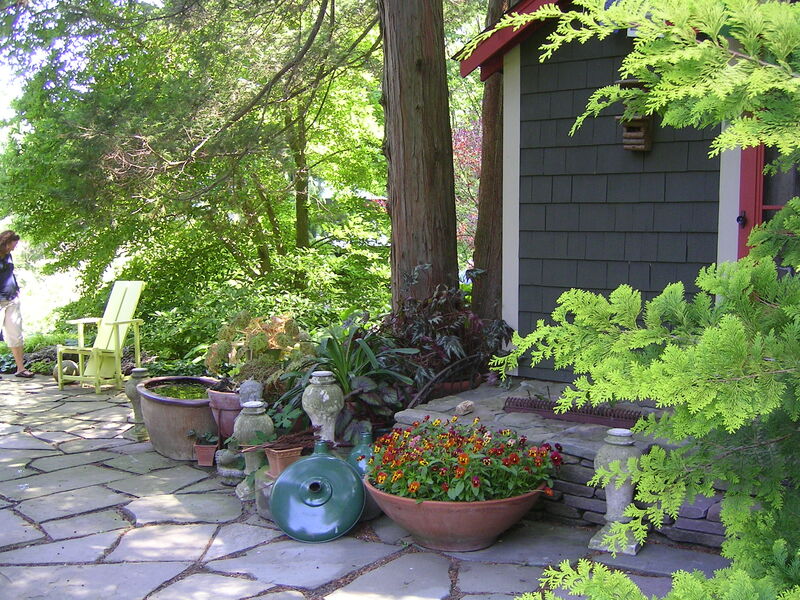 Margaret over-winters at least two Japanese maples in pots in her garage; they come out in the spring when they re-sprout their tender leaves and one spends the season on this dry-laid stone wall terrace. 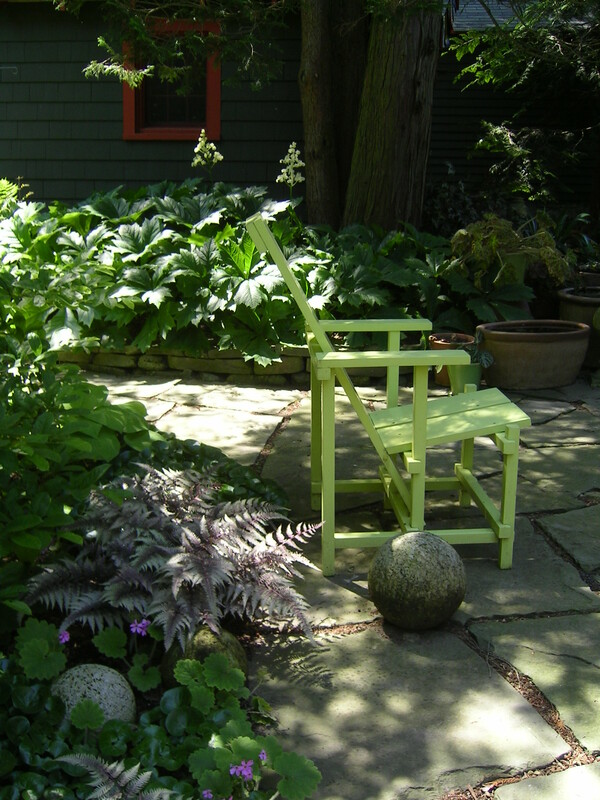 Margaret has several of these stylized Adirondack chairs (known as the ‘Wavehill chair’) around the property. They can be purchased as kits from the Wavehill Garden gift shop. 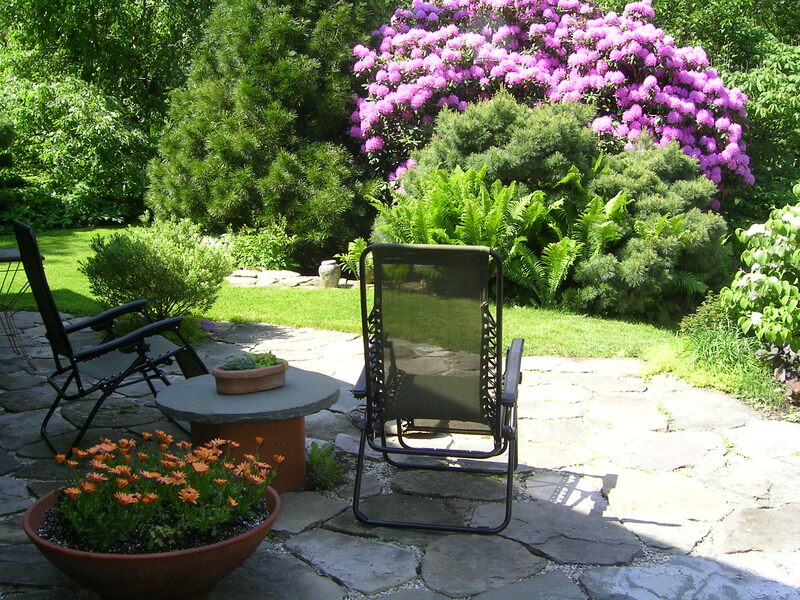 If you are able to at all, do make plans this summer to visit her garden (and others in the vicinity) during Open Garden days. You’ll need to send away for their directory, costing $21.95; this is where you’ll find all the gardens’ names and locations as well as their dates of opening. 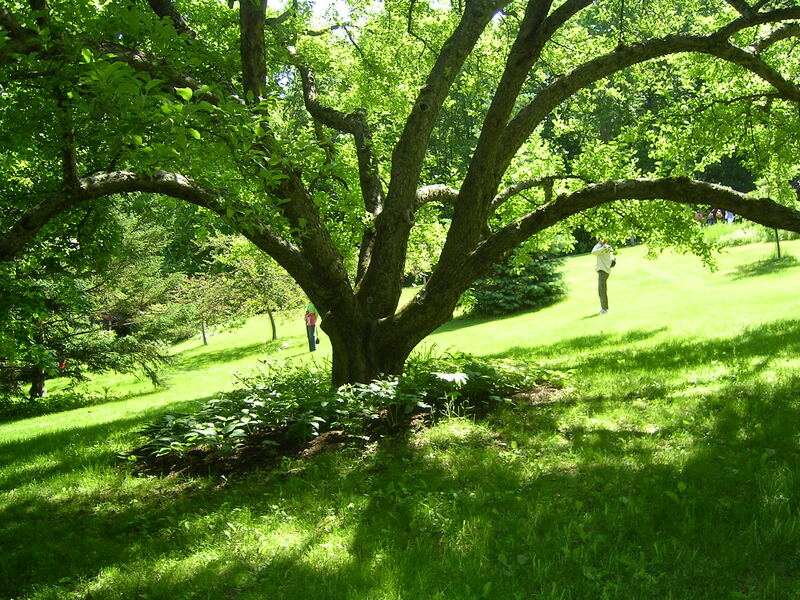 Then, when you visit a garden, its only $5.00 admission! Our trip to upstate New York was filled with more gems. I’ll post later about our stay in the town of Hudson, our visit to Loomis Creek nursery and our harrowing trek to Kykuit, the Rockefeller Estate overlooking the Hudson River. Great to see this post from the depths of such a winter. 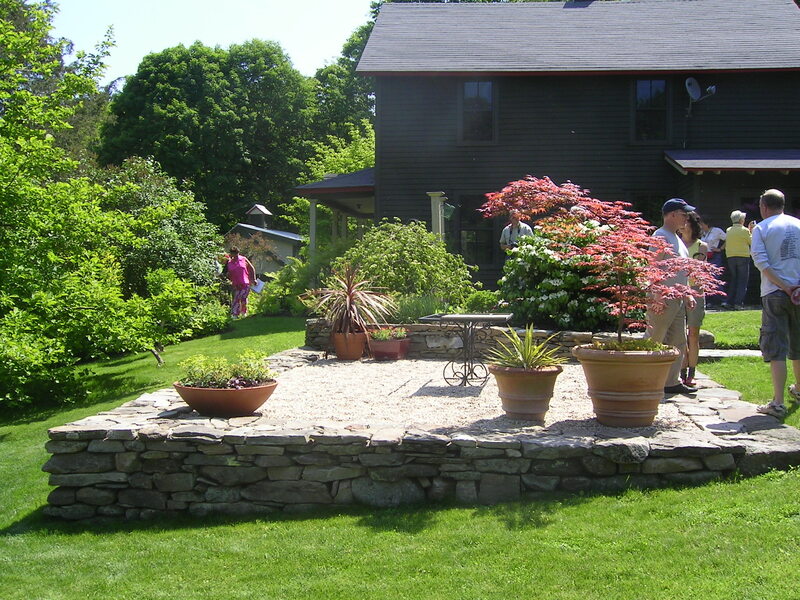 We visited two years ago on the Garden Conservancy Open Days too. 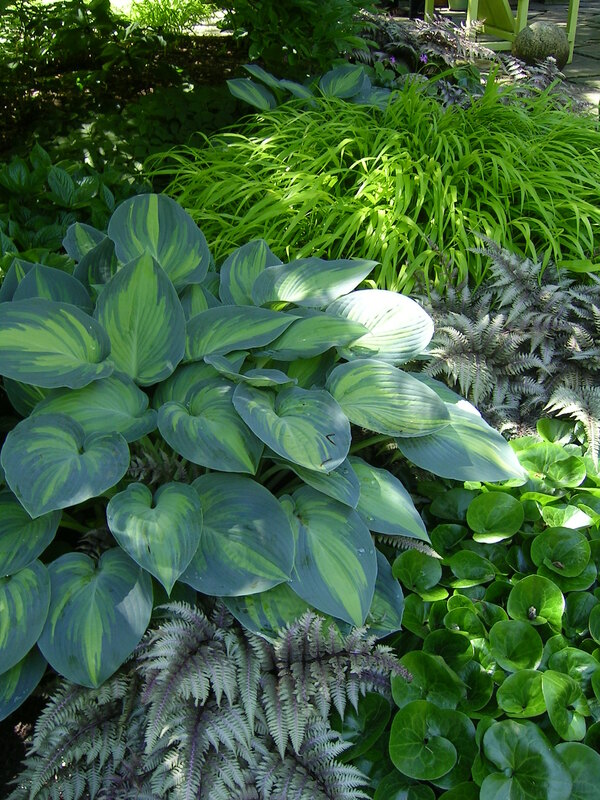 I love that Rodgersia in the next to last photo. The shape of the leaf is different from most Rodgersias I can find. Tom Stuart-Smith used one with a similar leaf in his Chelsea “Gold” garden a couple of years ago–the one with the cloud-pruned Hornbeams. You must have the same deep blanket of snow that we do James.